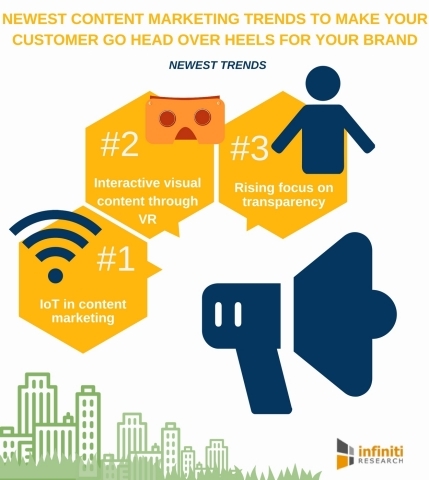 LONDON--(BUSINESS WIRE)--Infiniti Research, a world-renowned market intelligence solutions provider, has announced the completion of their latest article on the biggest content marketing trends you should be following in 2018. Content marketing is all about offering the user with truly pertinent and useful content rather than just pitching the products and services to them. It comprises of development and distribution of interesting content to attract and convert prospects into customers and customers into regular buyers. It has more to do with educating your audience so that they know, like, and trust you enough to do business with you. This marketing technique uses online channels such as podcasts, blogs, video, and social media sites as a medium to reach out to the target customer groups. Content marketing has become a popular marketing technique and is evidently here to stay. With a huge number of marketers turning successful in brushing up their own strategies, 2018 will witness some thrilling content marketing trends. Also, with more content being created now than ever before, users can guess to see some fresh and innovative content from their favorite brands. “As traditional marketing strategies are becoming less popular with the audience, forward-thinking marketers are on the lookout for newer and better strategies like content marketing to keep the customers hooked on,” says an industry expert from Infiniti. Rising focus on transparency: The market competition is rising up by the day, putting businesses under huge pressure to not fall into the bad books of customers. Modern customers anticipate businesses to be reliable, transparent, and driven to give back to society. Going forward, all the brands need to concentrate on transparency and disclosure. With the growth of endorsements and influencer marketing, this has become very crucial to build relationships with cautious customers. Infiniti Research is a global market intelligence company offering strategic insights to help look beyond market disruptions, study competitive activity, and develop intelligent business strategies. Listed below are the biggest content marketing trends you should be following in 2018. Content marketing is all about offering the user with truly pertinent and useful content rather than just pitching the products and services to them.